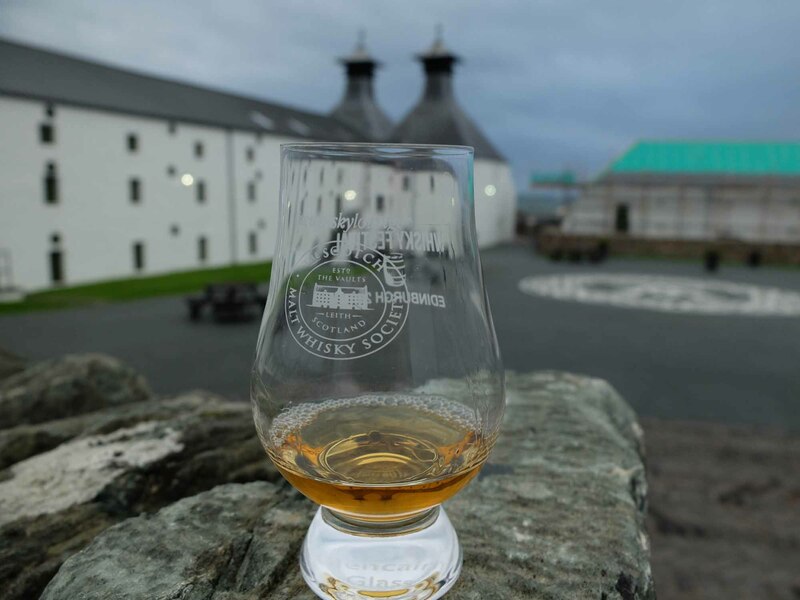 On a recent trip to Islay, we made it our mission to not only visit every distillery, but also take a dram from each distillery back ‘home’. 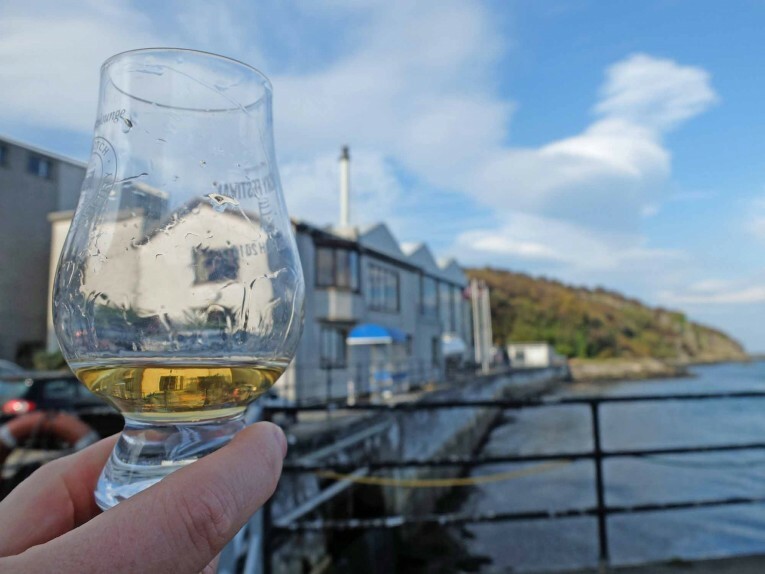 The initial plan was to do this for all 8 active distilleries, but I bent the rules a touch and brought a Port Charlotte too, as I wanted to visit the proposed / old site of this possibly-still-being-planned distillery – bringing a sample of its namesake along from nearby Bruichladdich. Oh, and I actually didn’t realise how much of Port Ellen is still standing, or I’d have brought a 10th sample along to honour our departed friend..
An early morning drop of Uigheadail comes home to Ardbeg. 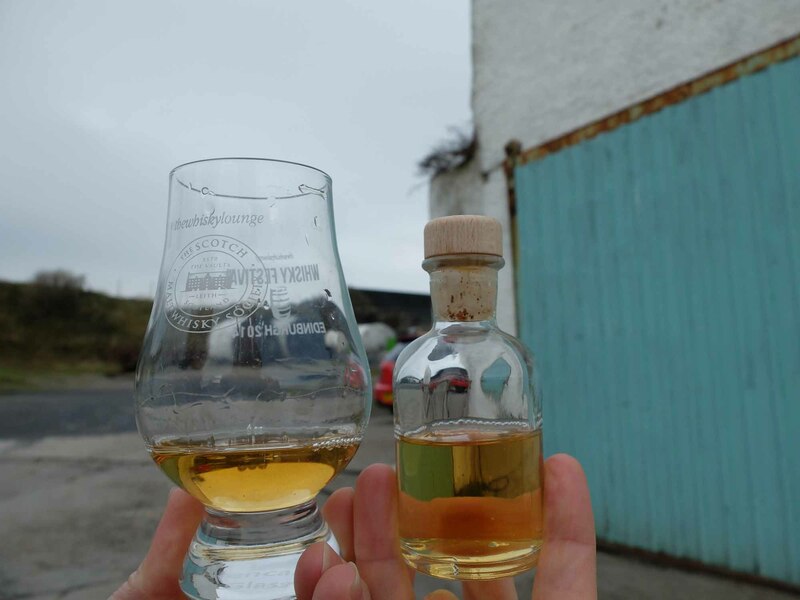 Lagavulin meets its offspring (and a lot of wind) in the form of a Dun Naomhaig Water 40% bottling. 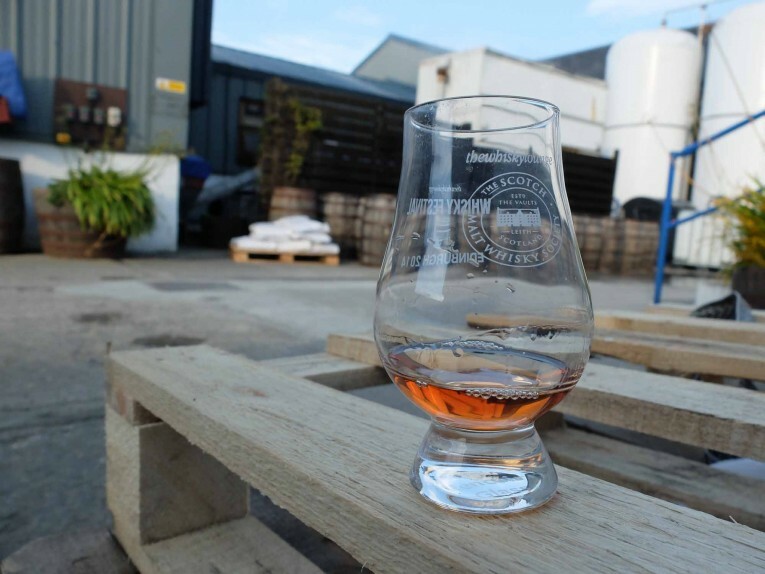 This Gran Callejo cask offering was distilled down the road from the old Port Charlotte distillery site. 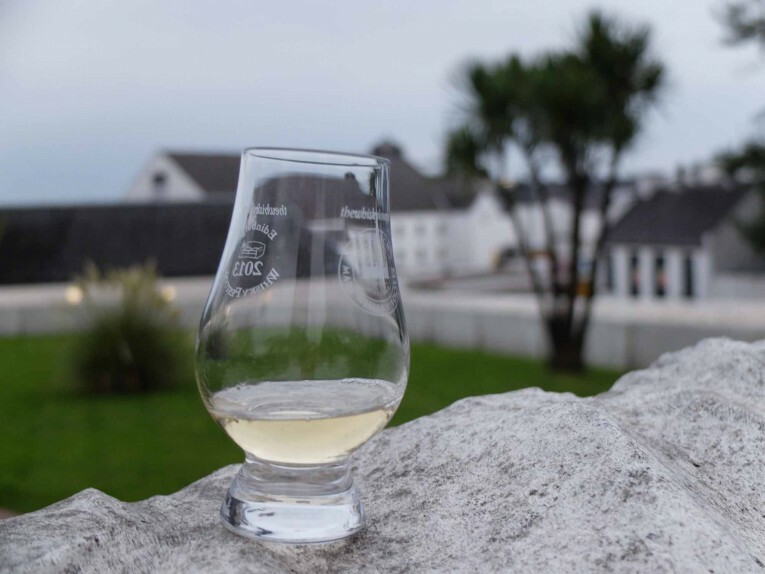 I was impressed at how exceptional this 12yo sherry cask Bruichladdich tasted in the distillery courtyard. 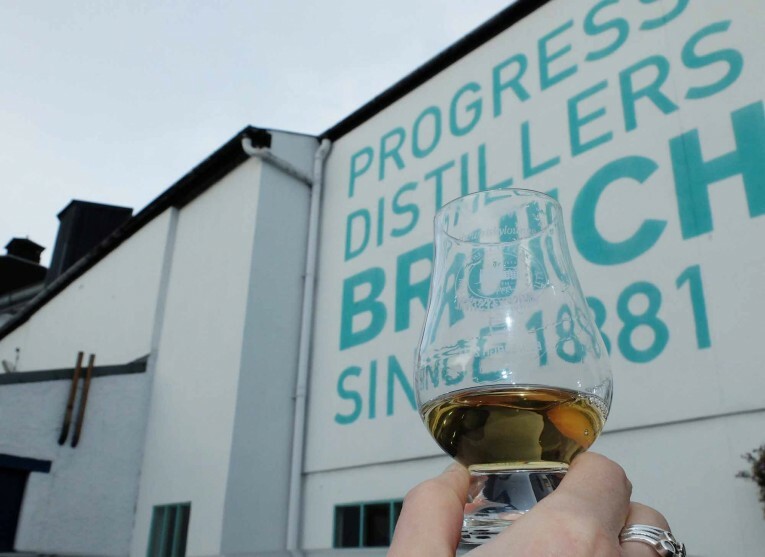 A quick shout out for Bruichladdich now we’ve travelled down the road from Port Charlotte: The distillery is cool (you park in the belly! ), and the shop was the best on Islay. Loads of distillery-exclusive bottles as well as interesting cask finishes and, best of all, one of only 2 distilleries on the island with a ‘bottle-from-the-cask’ system, and with two casks at that (Bowmore is the other, but we arrived at the changeover week, so no joy). The insanity of this 11yo bourbon cask Bowmore shone through with the sun as we said hi to the family. This 23yo Bunnahabhain from Berry Bros came home to its beautiful surroundings, not quite captured in this photo..
Bunnahabhain probably won the ‘most interesting distillery’ award. It’s down a tiny road along the coast from Port Askaig and it’s a mixture of attractive white buildings and horrible grey ones. But it felt like a real, working distillery. A man covered head-to-toe in soot guided us to the shop, as it’s just an open site – no guided, branded walkways here. A chalk board lists the day’s tours and a massive pier presumably still functions as the main route in and out. It also had a pirate vibe about the place, which is always a bonus. A classic Caol Ila 12yo was brought back to its birthplace – the sun even making this factory-distillery attractive. 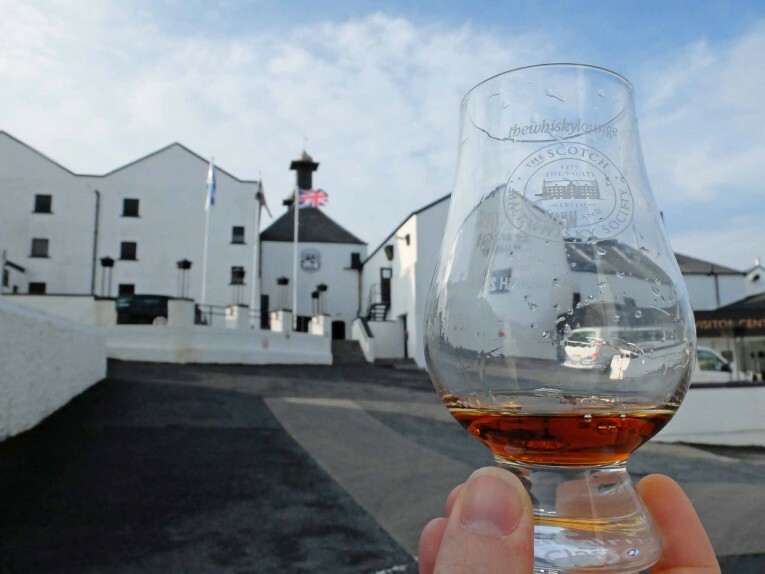 Ahh, lovely Kilchoman. This pink port cask wonder was brought back home to the farm, only a few years after leaving. And before we get to our last distillery, a quick note on Kilchoman: It’s a perfect, little distillery. The whole process is visible in just 2 rooms, and it has a wee bottling plant as well. 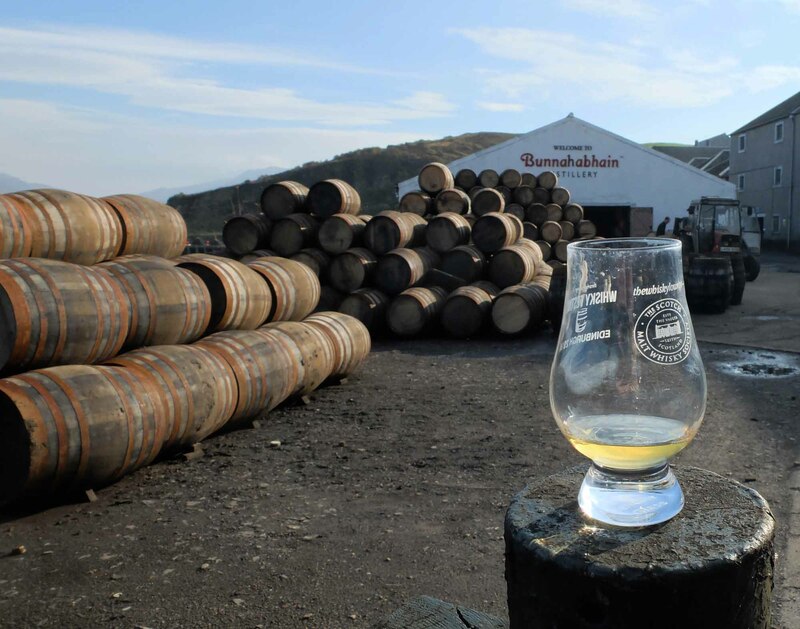 I’d never actually seen a stillman working as a distillery tour passes through – but that’s what you get here, and it’s not for show. As we left we popped our heads in to the stillhouse to have a quick chat as they worked away, and they couldn’t have been nicer. They were happy to answer all our questions and gave us some of the spirit coming out of the still (75% abv!) to try too.. a great way to depart! 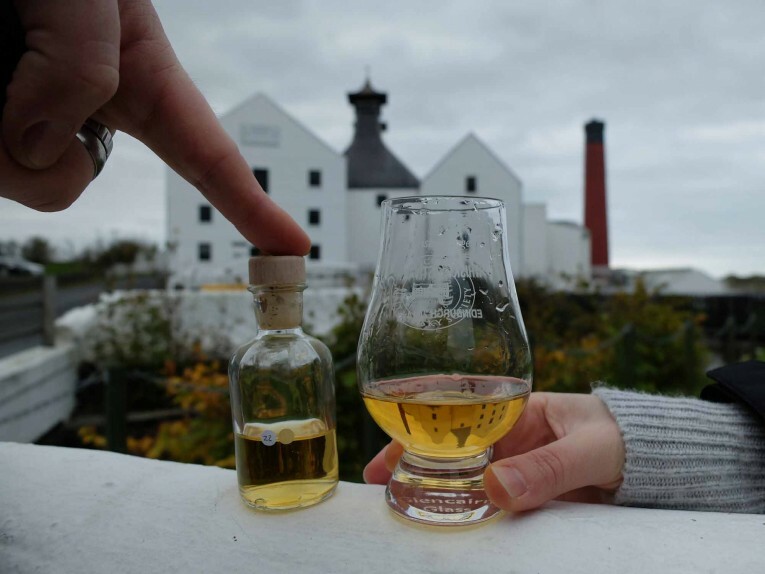 As the light started to fade, we completed the set at Laphroaig bringing back this ‘As We Get It’ bottling. This entry was tagged ardbeg, bowmore, bruichladdich, bunnahabhain, caol ila, islay, kilchoman, lagavulin, laphroaig, port charlotte, whisky. Bookmark the permalink. ← Silent Stills at Seamus’s – Sligachan, Skye.